Economic pundits and the Wall Street captive media are fond of telling people that the stock market is a discounting mechanism and that it leads the economy. I’m just as fond of showing that the market does neither. Both the market and the economy are mechanisms that respond to changes in macro liquidity. The Fed is at the controls, and when the Fed pulls the levers, both the market and the economy move. Another idea that mainstream economists are fond of is that there’s a lag between Fed policy actions and economic activity. That’s not true either. Although intervals vary, the response is virtually immediate. When the Fed says, “Stop!” or “Turn!”, the markets and the economy obey immediately, although the changes may not be noticed by those who aren’t paying attention or who are looking at false data. 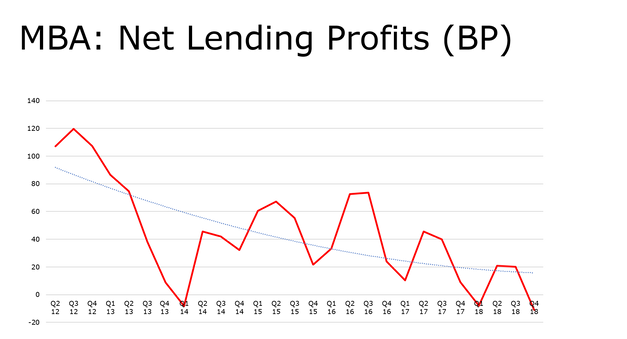 False data includes not only intentionally fudged data like hedonic CPI adjustments, or the birth death adjustment in the monthly employment data, it also includes seasonally adjusted data which is widely accepted as if the seasonally adjusted number was the actual number. It’s particularly misleading when reported in the opposite direction of the actual change. That happens all too often, but even when the direction of the seasonally adjusted reported numbers is the same as the actual direction there’s a false impression of specificity. In reality, the seasonally adjusted data point may not remotely resemble the actual level or change. It is a meaningless and frequently grossly misleading number. In my view it is far more useful to look at the actual data and compare it to past years to get a handle on what’s really going on. Here’s an example- factory orders. Earlier this week it was widely reported that factory orders unexpectedly jumped. Here’s how Bloomberg reported it. American factories unexpectedly received more orders in November, signaling that gains in consumer spending, business investment and exports will sustain the manufacturing recovery. The 0.7 percent increase in bookings topped the median forecast of economists surveyed by Bloomberg News which called for a 0.1 percent drop..
Orders actually fell by 3.1% in November. Did you see that fact anywhere? No? Me neither. In reality, that’s not too bad for November, when orders are usually down. It was better than the 1o year average of -4.9%, but that 10 years includes 4 recession years. This year’s performance was not as good as 2004’s- down 0.9%, or 2005’s down 0.9%, or 2006’s down 1.9%, and it was similar to 2007’s -3.2%, just as the recent recession was starting. It is an improvement over the past two years. Orders were down 14.1% in November 2008 at the nadir of the collapse, and they were down 4.9% last year. So all in all, this year was pretty good compared to recession years, but not so good compared with non-recession years. Looking at the chart, we can see that the rate of improvement was very strong from mid 2009 through early 201o (lower graph), but that since then the annual growth rate has peeled back sharply, dropping below its 12 month moving average. In the past, when the 12 month rate of change drops below its moving average for more than a month or two, that’s been the first sign of contraction. In 2000 that signal led both the turn in manufacturing orders and in the stock market. In 2006, that signal only led to a period of slower growth. Stocks kept rising. What kept factory growth and stock prices from going negative in 2006? My answer, as always, is Fed money printing. When the Fed adds assets to its balance sheet, it keeps bubble dynamics working and the champagne music machine plays on. The Fed turned the machine off in 2007. Stocks immediately stopped rising and the growth of factory orders halted. When the Fed began redeeming its Treasury holdings in 2008 to pay for a variety of direct bailouts to the banking and industrial sectors stocks collapsed. However, the reaction in the factory sector was delayed as the Fed diverted cash from the leveraged trading fraternity that is the Fed’s cohort and usual pipeline, to a variety of other economic actors, including the manufacturing sector. The Fed in effect fed other economic sectors by depriving the Primary Dealers. That didn’t work for long. In late 2008 the Fed recognized that it would need to begin feeding its Primary Dealers (PDs) again, and it began to rebuild its securities holdings through purchases of GSEs and MBS. Only the GSE purchases went through the Primary Dealer trading accounts. That was not enough to turn the tide, so the Fed began buying massive amounts of Treasuries from PDs early 2009. That turned the tide, and once again both the stock market and the factory sector immediately responded. The Fed then stopped pumping in March of 2010. Without that flow of cash from the Fed, the dealers could not longer support stock prices. Stocks turned lower. Factory orders leveled off. With stocks weak and threatening to break major support, in August the Fed began sending cash to PDs by buying Treasuries from them, ostensibly to offset the prepayments of MBS that were causing its balance sheet to begin to shrink. The stock market immediately responded. 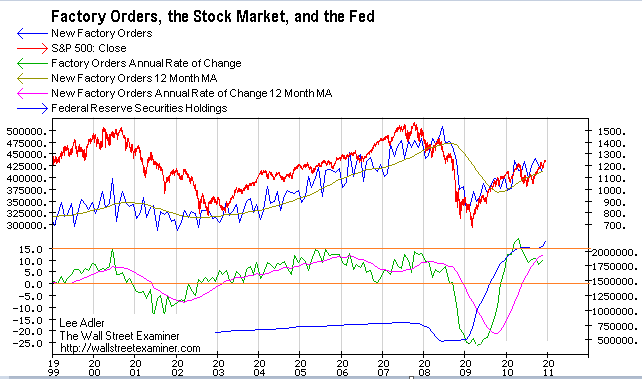 The Fed did not begin adding to its total securities holdings until it began QE2 in November. Stocks continue to respond positively. Factory orders, while growing more slowly than with the first round of Fed printing, continue to maintain a positive trend. Normally, I would expect factory orders to again respond to the Fed pumping, but frictional forces are growing in the financial system. I will continue to track these forces on a weekly basis in the weekly Fed and Treasury Reports that go out to subscribers. My colleague, Russ Winter, believes that these forces will be strong enough to stop the economy and the market in their tracks, in spite of the Fed’s pumping. I disagree, but I do think that strengthening economic data and cost pressures from rising commodity prices driven by the Fed’s printing, will give the Fed cover to stop QE2 in June as scheduled, if not sooner. You can hear the debate between Russ and me in this week’s Radio Free Wall Street podcast (Part 1 free). Rising stock prices and economic activity driven by Fed money printing carry within them the seeds of their own destruction. Sooner or later they will force the Fed to stop, and we have seen what happens when it does. Stay up to date with the machinations of the Fed, Treasury, Primary Dealers and foreign central banks in the US market, along with regular updates of the US housing market, in the Fed Report in the Professional Edition, Money Liquidity, and Real Estate Package. Try it risk free for 30 days. Don’t miss another day. Get the research and analysis you need to understand these critical forces. Be prepared. Stay ahead of the herd. Click this link and get in RIGHT NOW! Sense of humor?… For some reason the following quotes about SOMA from Aldous Huxley’s “Brave New World” reminded me of their selection of Jekyll Island for both their founding and centennial celebration? Btw, Who owns the Fed? Thank you for sharing your thoughts and work, Lee. This was an enlightening post.